Heschel, A. (1951) The Sabbath New York, NY: Farrar, Strauss and Giroux. 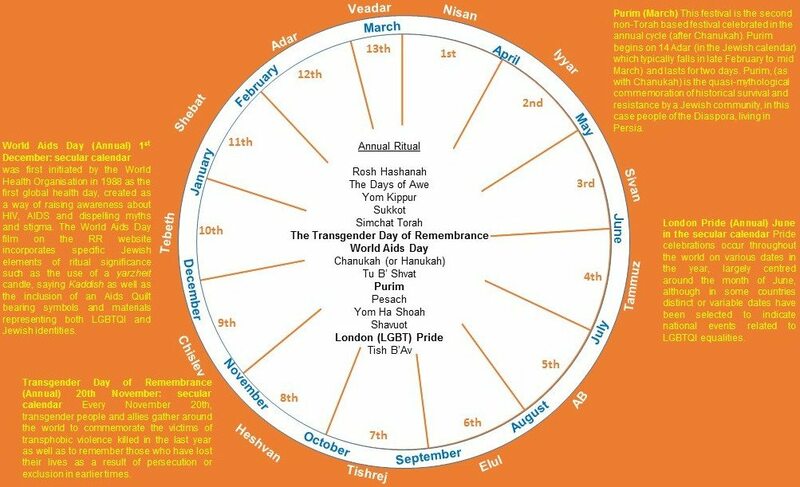 The information provided below in relation to the ritual year, whilst recognised and adhered to by all Jewish denominations in terms of celebration and commemoration of holidays, fasts and festivals, is written from the perspective of a ‘Progressive’ (Liberal) Jew. Variants in practice and belief (including whether abstention from work should occur at all, or for one day or two during major festivals) varies from denomination to denomination, with Progressive (Liberal/Reform/Reconstructionist) Jews mainly abstaining from work on only the first day of a festival and interpretations of how the Sabbath should be celebrated being different from interpretations followed by more ‘Orthodox’ co-religionists. 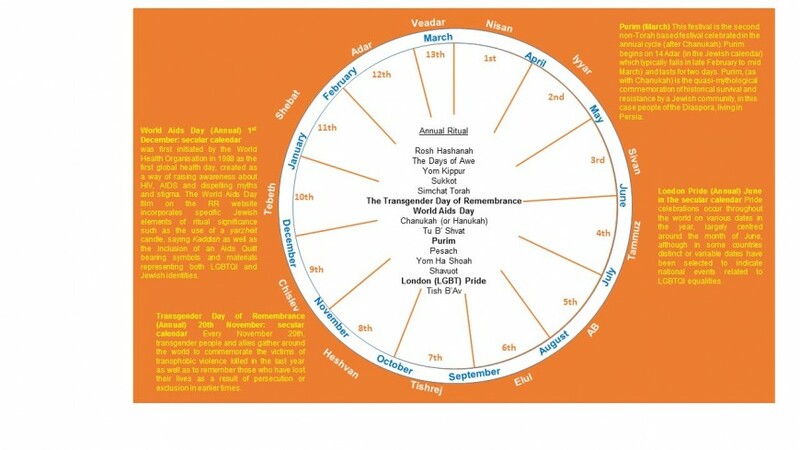 A number of minor fasts and commemorations for example Tzom Gedalia (the Fast of Gedalia) or the Shiva Asar B’Tamuz (the Fast of the 17th Av) observed by ‘Orthodox’ denominations are not usually celebrated as part of the Progressive Jewish ritual year. The famous quote from Rabbi Abraham Heschel given above, summarises the way in which the central concepts of the Jewish faith are made accessible to the community, and embodied; through being embedded in temporal and physical activity. Thus, feasts and fasts are celebrated on specific days within a yearly cycle, determined by the lunar calendar, following long – established patterns and rooted in the physical world through use of ritual concrete objects such as candles; specific food items; texts; scrolls and prescribed locations (for example eating in the Sukkah during the ‘Feast of Booths’ in a temporary construction through which one must be able to view the stars). The summaries below outline the key moments in the ritual year, which commences with the Festival of Rosh Hashanah (The Jewish New Year or ‘Head of the Year’) and moves through the annual cycle in conjunction with set ritual activities (which may take place either in the home or in Schul (Synagogue). The annual cycle is interspersed with set weekly readings from the Torah scroll, (a ritually prepared scroll which contains the Pentateuch or first five books of the Jewish (and Christian) Bible: Genesis; Leviticus; Exodus; Numbers and Deuteronomy) and associated Haftarah (readings from the books of the Prophets; thematically linked to the parasha (Torah portion) that precedes it). The parasha and haftarah are studied in Schul, or in private or communal study at home or in community settings. These readings occur publicly in synagogues during Festivals, as well as during Saturday (Sabbath) services. Sabbath (Shabbat) and indeed all Jewish Festivals commence in the evening of the appointed day, at the moment when the first star is sighted in the sky. The reason Jewish festivals commence in the evening rather than in the morning is because we are told (in Genesis 1:5: in the narrative of the creation of the world) “And it was evening, and it was morning.” Thus first we have the night and then the day in Jewish time. This approach it can be argued underpins a core element of the Jewish cosmology and theology, as darkness (which can represent a personal challenge; period of oppression or state of lack of knowledge) passes away and in time, light dawns. This richly ‘Jewish’ conceptualisation of spiritual and temporal knowledge arose on a number of occasions during this project amidst debate in focus groups, theological panel discussions and conversations, as participants and Rabbinic advisors referred on a number of occasions to the fact that they believed profoundly that full equality and inclusion of LGBTQI members of the Jewish (and broader faith) communities must, and will occur, as human knowledge and understanding expands. For a rabbinic exploration of how Torah and other texts (including extensive Rabbinic commentary on law and practice contained within the Talmud) support this argument, see the RR film of the ‘Rabbinic Discussion Panel’ held on the 24th November 2015, available on this website. Sabbath (Shabbat) which unlike other occasions discussed below takes place on a weekly basis; is traditionally represented as the ‘crown’ or ‘jewel’ of the week, surpassed only in holiness by Yom Kippur (“the Sabbath of Sabbaths”) a festival which is discussed further below. Sabbath (like all Jewish festivals) commences in the evening at the moment the first star is sighted. The core and immutable point of the Jewish spiritual and temporal world is the Sabbath. A day which is set apart completely from the rest of the workaday world, and one which is for spiritual recuperation and rest. “On six days work may be done but on the seventh day there shall be a Sabbath of complete rest, a sacred occasion” (Leviticus 23:3). Whilst in different denominations of Judaism there are varying degrees of strict observance of the Sabbath, such that some very Orthodox communities will spend the day in study and prayer and will follow interpretations of the ‘laws’ of Shabbat based on their reading of Leviticus 24 which prohibit writing; the manual switching on of electric items such as a light-switch; will cook in advance and retain the warmth of food in ovens lit before the Sabbath “came in” etc. that is but one interpretation of how the Sabbath should be ‘kept’. Progressive Judaism (a broad description which includes Liberal Judaism who are partners in this project) interprets the regulation of the Sabbath as requiring setting aside time from work (profane temporality) and making the day distinct and separate (sacred time). This sacred time requires not only study and prayer but also allows space for personal pleasure and to connect spiritually and empathetically to other people and the world surrounding us. Accordingly, honouring or keeping the ‘joy of the Sabbath’ (oneg Shabbat) may involve elements as simple as self-care in a busy world through activities such as having a long luxurious bath; reading a book or a newspaper which has previously been set aside through lack of time; socialising and sharing a meal with family and friends; perhaps attending a religious service, and walking in the park to feel as one with nature. Kedushah, the Hebrew word for ‘holiness’ means to ‘sanctify’ through ‘setting aside’ or ‘making different’. Leviticus 24 which specifies how Shabbat should be observed, outlines the obligation to sanctify both space and time. It has been commonly said that Jews should sanctify time by putting aside daily occupations and space on Shabbat by putting aside the corners of the fields which provide our harvest (money, resources) for those in need, be they family and friends or others experiencing oppression, poverty or estrangement from community.